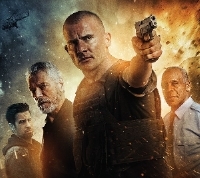 Gridlocked (review), Allan Ungar's thrilling and funny throwback to action films of the 80's and 90's recently had its Canadian premiere at The Toronto After Dark Film Festival. It also played Edmonton's DEDFest as well as Fantastic Fest last month in Austin. The film has been embraced by critics and festival crowds alike for its love of a bygone action era and should be seeing release sometime early next year. In the meantime, we got Ungar on phone to chat about making the movie, his influences and how the hell he manged to get The Hard Way's Stephen Lang AND Lethal Weapon's Danny Glover in a film that pays such homage to the legacy of those actors. We also touch on fun stuff like how films are financed, and why video game movies are due for a makeover.